Jose Mourinho endured a miserable return to Stamford Bridge as rampant Chelsea thumped a lacklustre United to inflict a first defeat in six games. Mourinho was returning to Stamford Bridge as United boss for the first time since being sacked in December but his day could hardly have been any worse. The scoreline did have a slightly flattering look but Chelsea were deserved winners with United shoddy and shambolic throughout. Chris Smalling and Daley Blind suffered tortuous afternoons as the visitors gifted Antonio Conte's side all four goals to crash to a third defeat of the season. The tone was set after less than a minute when Smalling failed to deal with a long ball, David de Gea rushed out to clear and Pedro slipped the ball into the empty net from close range. Zlatan Ibrahimovic went close with a header and Thibaut Courtois saved well from Ander Herrera and Jesse Lingard, but United never recovered from the opener. 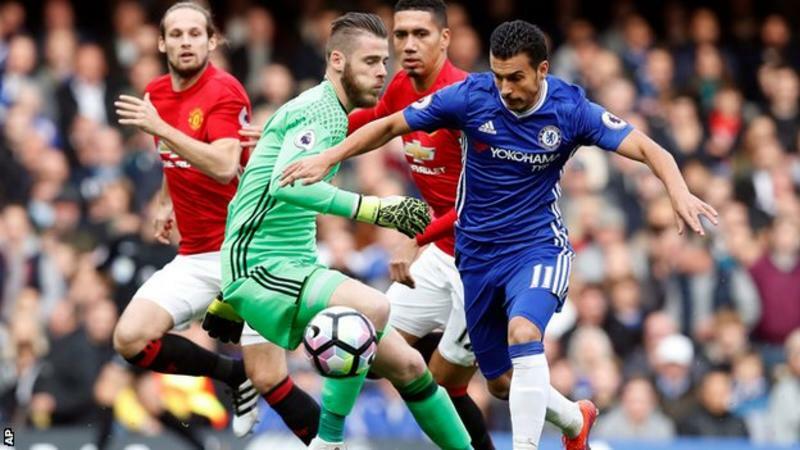 De Gea saved well with his foot to keep out Diego Costa but was powerless to prevent a second as the hosts doubled their lead on 21 minutes. The basic element of defending a set-piece eluded us as we switched off again to allow an unmarked Gary Cahill to stride in and prod the ball home after two deflections. There was little sign of a once-famed comeback from United after the break as Chelsea put the result beyond any lingering doubt shortly after the hour mark. It was another gift from an increasingly charitable backline as Eden Hazard was given time and space to advance on goal and fire in from 15 yards. N'golo Kante walzted through a static defence to make it 4-0 and inflict Jose's heaviest Premier League defeat. Eric Bailly was forced off with a "serious knee injury" to compound our misery further and his replacement, Marcos Rojo, went close with an effort from distance that Courtois tipped over the top. That was the final action on a desperately disappointing night, but every team has a bad result and we'll look to get back to winning ways when we welcome City in the EFL Cup on Wednesday. The result sees United sit seventh, six points behind early Pep Guardiola's early league pacesetters albeit still at an early stage. United Faithful Man of the Match: Antonio Valencia.